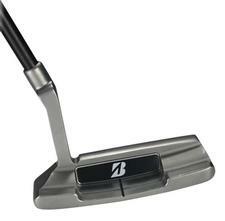 Bridgestone Golf TD-03 Putter Graphite Shaft - $199.00 - GolfersEdgeOnline.com - Best Golf Equipment On The Web! Bridgestone True Balance putters have taken feel to the next level. It has a 100% EVA lightweight grip and a lightweight graphite shaft which moves the balance point 5" from the sole of the putter. This wight transformation squares the head at impact and improves speed and distance control. The dual layered grooved insert provides a true roll and a perfect feel to make more putts. If you have any more questions about the Bridgestone Golf TD-03 Putter Graphite Shaft; do not see the model you are looking for; need custom options; or prefer to not purchase online, then please call us at (630) 656-1291.